Garrett was two weeks old yesterday. Today he had his two week doctor’s appointment. He now weights 6lbs 4oz. That’s a total gain of 10 ounces from his discharge weight! Yay! Oh and he’s now 18.25 inches, that’s a growth of 1.25 inches! In two weeks! I can’t hardly believe he’s grown that much – someone must have been a little off, either the measurement in the hospital or this one. But I guess anything is possible. I still think we’re a little messed up on our days and nights, although not nearly as bad as we were. I am already noticing that he’s not napping as much as he used to in the daytime. (Ugh!). Well let me explain that – he’s not sleeping for very long periods of time anymore. But I’m excited that he’s awake more, though. And although I don’t want him to grow up too fast, I’m definitely ready for him to get a little bit older and get a personality and big enough where we can play! Plus I’m reading for him to have neck muscles! He’s not spitting up nearly as often as he was. But I don’t know if this is because I am learning how to manage it better with slower feedings/more burping or not. Who knows. All I know is that it’s definitely nice not to be mopping up so much spit up at every feeding. However, feedings are not really getting any easier. In the daytime it’s not too bad. But at night they can be horrendous. I talked to the pediatrician about this today. He’s been getting very fussy at nighttime. According to the doctor it’s because by the time he’s woken me all the way up and I get him changed and settled in to eat he’s starving and goes kind of crazy. Even though I’m right there with the bottle he’s fussy, flailing his arms and legs and moving his head side to side and totally ignoring the bottle that I’m trying to give him. Apparently this is all 100% normal. That was reassuring – now if only he would stop that bad habit! Haha. She said that the main thing is to get him fed when he first starts his cues (which is what happens in the daytime, because I’m there to notice them). A work in progress, I suppose 🙂 Plus I’ve noticed that giving him a drop of Mylicon (gas drops) with every other feeding is helping as well. Buster the Westie is really adjusting quite well. For three years he’s been our baby. We knew the adjustment could and would be difficult. But I’ve been pleasantly surprised with how well he’s doing. He no longer barks when Garrett is crying/fussy. He no longer barks when Nathan is holding/paying attention to Garrett. And he’s definitely improving when people come over to visit Garrett and not him. I’ve noticed that he follows me upstairs with Garrett for feedings and diaper changes. It’s like he’s watching over us. I think he’s going to be quite protective of Garrett before it’s all over with! I’ve been doing a little bit better. I’ve been a little overwhelmed here at the house all day long by myself. My parents and Nathan’s parents have all been down numerous times of course, but for the most part it’s just me, Garrett and Buster Monday through Friday 7:30am-5pm. I’m not used to having to be completely responsible for someone so helpless. I mean the dog is pretty well self-sufficient at 3 years old (all he needs is food and water in his bowls and bathroom breaks in our fenced in backyard). I know I had some pretty bad mood swings the first week or so. I would cry for no reason. I would get very upset when I couldn’t soothe Garrett. But I’ve learned to step back and just breathe through it. I think I’m almost out of my baby blues (or at least I hope I am). I am back in my pre-pregnancy jeans! Yay! I was in them 8 days after baby. Now, before you all hate me, and I do give you permission to do so, there are some things you need to know. First, I was overweight before I got pregnant and didn’t gain but 20 pounds total during my pregnancy. Two of those pounds were lost in the last two weeks of my pregnancy and 7 more were lost during my first 24 hours in the hospital after delivery. The rest of it, well I think I peed it all out! Seriously, I thought I had to go all the time when Garrett was on my bladder, it was nothing in comparison to how much I went when I was first home from the hospital! Second, I was ALL BELLY! Plus it didn’t hurt that my pre-pregnancy jeans were a little on the big side before I got pregnant anyway. And lastly, while I may be back in those jeans, it doesn’t mean that my stomach doesn’t have a pouch to it – it definitely does. I think I could do ab exercises for the rest of my life and I would never get rid of that pouch. But of course I’m not doing any exercising until I get the go-ahead at my 6 week postpartum appointment. And you know what the best part about being up at 2:30 in the morning with a baby wanting to be fed and then needed to be held for a good 20 minutes after eating to avoid spitting up once I lay him back down in his crib?? I have learned how to download e-books from my local library to my iPhone and can read a little bit while I’m waiting to put him back down! Awesome, right? Oh and all those times that he’s napping and I should be doing the same? Well, I’m using that time to get a little bit of reading in as well! All of a sudden I want to read 24/7. The last few months of my pregnancy reading was the last thing on my mind. Now I can’t get it off of my mind. Crazy, right? I think I will be able to find a good balance with my reading and baby responsibilities! Yay! So there it is. My two week update. I could probably find more to write about. But I’ll save that for another day. 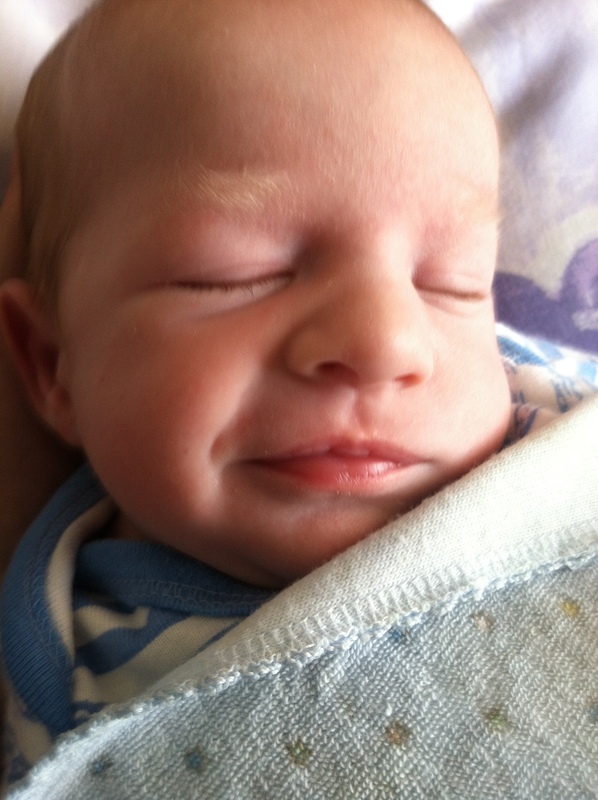 For now, I’m going to leave you with another picture of my totally adorable son. I had been trying to capture the elusive grin he sometimes gets after he eats (and right before he poops, lol) and I finally got it!! That is totally a familiar “facial expression” that I remember well from my nieces and nephews as babies. You are right Tara the expression is used right before a diaper gets soiled! So happy you are finding your “routine” and hope as time passes and you are “released” by your doctor that you will find packing up baby G and getting out of the house helps your mental state more than you would think. As for the being totally responsible for another human, that my dear lady is overwhelming to all of us whether it is a newborn baby or an invalid.